We have looked at 10, 12, 20, 24, 30, 40, 60, and 120 year cycles. 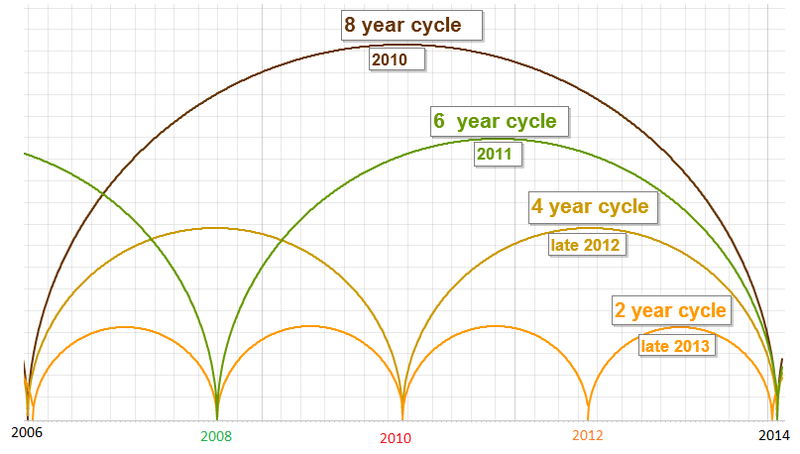 Even the shortest of these cycles is longer term than most of us would use for trading. Still it is worth knowing the longer term context within which you are trading. The last 4 cycles Kress incorporated within his studies of cycles are 2, 4, 6, and 8 year cycles. 2 and 8 are Fib numbers; 2x2 (or 4) and 2x3 (or 6) are multiples of fib numbers. So the previously discussed Fib relationship holds. Some of you may use the shortest of these for trading - still though even 2 years is too long for Swing Trading (why I use the Kitchin and Wall cycles for swing trade discussion). Otherwise I am totally agnostic as to which group of cycles you choose to follow. I believe the discipline imposed by following a system (group) of cycles can improve your trading results and focuses the mind. No system is perfect, but some are worthwhile if you make better trades and earn more for your efforts. Clif Droke has written a book (just released) that discusses weekly cycles Kress used in his market analysis. This is supposedly new information not formerly released by Kress. But we can guess that the # of weeks are Fib multiples. I am guessing 10 weeks (Half a Wall cycle), 20 weeks (Wall cycle), 60 weeks (1/3 Kitchin cycle), 40 months (Kitchin cycle), 120 months (10 yrs). If anyone has the new Droke book -- let me know. Glad you find it interesting. Not a lot of it is original (except the very last part on short cycles I use in my swing trade analysis), but a longer term outlook may keep us from being surprised and encourage us to set buy/sell limits.